Smart lighting and control systems are being extensively used in several sectors as they offer exceptional energy-efficient along with automated control. The demand for these technologies and systems are expected to soar in times when energy consumption and its hazardous impact on the environment have become a heated debate. While the smart lighting solutions allow energy optimization, the control system permits users to control the luminance levels of lighting in accordance to the ambiance, intensity of daylight, infrastructure, and others such as occupancy, and physical presence. According to the research report, the global market is expected to be worth US$96.38 bn by the end of 2024 as compared to US$26.26 bn in 2015. The market is estimated to surge at a CAGR of 15.6% during the period from 2016 to 2024. The global market has been witnessing a remarkable surge in the past few years due to the growing pressure of reducing the consumption of electricity. The need to create a sustainable environment by reducing the greenhouse gas emissions is also expected to spur the demand for these solutions and controls. Owing to these reasons, smart lighting and control systems are being deployed in industrial, commercial, and residential sectors. Furthermore, the increasing penetration of Internet of Things (IoT) and its integration with phones is also expected to boost the sales of smart lighting solutions and control systems. The market is also projected to receive a significant impact from the growing government initiatives to reduce conventional resource consumption is also providing impetus to the global market. On the basis of lighting source, the market for smart lighting and control systems comprises high intensity discharge lamps, fluorescent lamps and compact fluorescent lamps, and light emitting diodes (LED). LED accounts for a significant share in the overall market owing to the fact that it is used across various lighting applications. This can be attributed to its features such as low carbon emission and high energy savings. By way of end use, the smart lighting and control systems market includes commercial, residential, outdoor, and industrial lighting. Smart lighting and control systems are anticipated to find immense application in outdoor and residential lighting and these segments are likely to exhibit a strong growth rate over the coming years. The steadily rising demand for smart lighting in street lights and home automation is projected to aid the expansion of these segments. On the basis of geography, the global market is segmented into North America, Europe, Latin America, Asia Pacific, and the Middle East and Africa. Of these geographies, North America is expected to show dominance in the overall market. The region’s dominance will be due to the high adoption of technology and increasing effort to curb the hazardous impact of electricity consumption on the environment. However, the research report suggests that emerging economies of Asia Pacific, South America, and the Middle East and Africa will also offer lucrative opportunities to the global market. Some of the key players operating in the global smart lighting and control systems market are Acuity Brands Lighting, Inc., General Electric Company, Belkin International, Inc., Koninklijke Philips N.V., Eaton Corporation, Lightwave PLC, Elgato Systems, LiFI Labs, Inc., Lutron Electronics Company, Inc., and Honeywell International, Inc. The growing penetration of smart technologies across the world is projected to offer these companies lucrative opportunities in the coming few years. This report provides an analysis of the global smart lighting and control systems market for the period from 2014 to 2024, wherein the period from 2016 to 2024 comprises the forecast period and 2015 is the base year. Data for 2014 is provided as historical information. The report covers all the prominent trends and technologies playing a major role in the growth of the smart lighting and control systems market over the forecast period. It also highlights various drivers, restraints, and opportunities expected to influence the market’s growth during this period. 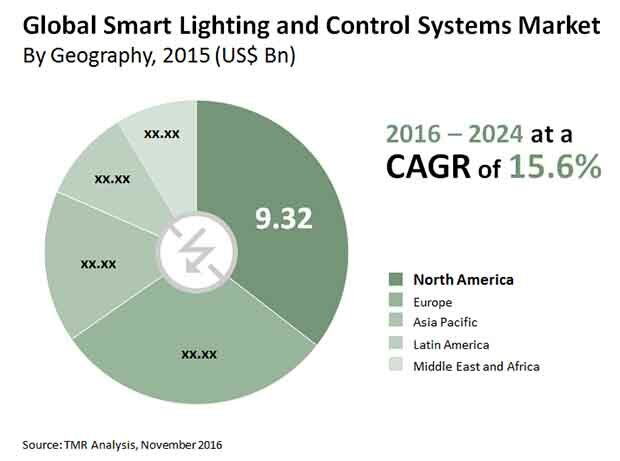 The study provides a holistic perspective of the growth of the smart lighting and control systems market throughout the forecast period in terms of revenue estimates (in US$ Bn), across Asia Pacific (APAC), South America, North America, Europe, and Middle East & Africa (MEA) regions. The report provides analysis of the global smart lighting and control systems market in terms of market estimates and forecasts for all the segments across different geographic regions. Smart lighting and control systems enable high energy efficiency and improved lighting controls in lighting applications. The increasing adoption across residential and outdoor lighting applications such as street lighting, parking lots, walkways, and others such as playing fields is developing strong demand for smart lighting and control systems across the world. The growing deployment of smart lighting solutions in street lighting projects, and home automation projects are primarily driving the smart lighting and control systems market. The robust demand for wireless lighting controls is forming around the globe owning to the growing penetration of smartphones and internet of things technology (IoT). In addition, the governments across the world are emphasizing on greenhouse emission awareness, and energy conservation by promoting substantial initiatives and implementing sustainable solutions which is supplementing the growth of smart lighting and control systems market. Businesses across these various sectors such as commercial, and industrial are focusing on implementation of smart lighting and control systems in order to reduce the operation and maintenance costs. Many vendors are integrating various technologies such as daylight sensing, proximity sensing, and smartphones with smart lighting to enhance the performance and competency of lighting systems. The penetration of IoT and other technologies such as cloud is rising in emerging economies such as South America, Asia Pacific, and Middle East & Africa is expected to offer opportunities for smart lighting and control systems market. In addition, increasing demand for implementation of smart lighting and control systems across outdoor lighting applications such as street lighting, walkways, parking lots, and others such as playing fields across the world is generating strong opportunities for smart lighting and control systems market. On the basis of lighting source, smart lighting and control systems market is segmented into fluorescent lamps and compact fluorescent lamps, high intensity discharge lamps, and light emitting diodes (LED). Based on end-use application, smart lighting and control systems market is segmented into residential, commercial, industrial, and outdoor lighting applications. By control system, smart lighting and control systems market is categorized into smartphone enabled technology, daylight sensing technology, proximity sensing technology, and others. The report also includes competitive profiling of the key players associated with the smart lighting and control systems market. The important business strategies adopted by them, their market positioning, and recent developments have also been identified in the research report. The increasing adoption of advance and wireless lighting controls has led to the substantial presence of smart lighting and control system vendors around the globe. Some of the key players in smart lighting and control systems market are General Electric Company, Koninklijke Philips N.V., Belkin International, Inc., Eaton Corporation, Lightwave PLC, Elgato Systems, LiFI Labs, Inc., Honeywell International, Inc., Lutron Electronics Company, Inc., and Acuity Brands Lighting, Inc.